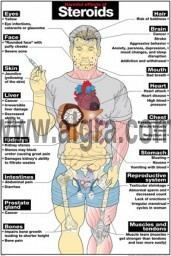 The Harmful Effects of Steroids Poster is designed to educate people about the effects that steroids have on the human body. This poster uses anatomical illustrations to display all of the side effects that steroids has on vital organs, including brain cancer, heart attack and kidney damage. This poster is a great tool for any education or health related facility. NEW 2013! 24" x 36" poster available in Paper, Laminated, and Framed.